In classical French cooking, a dish is NEVER served without a sauce. It is inappropriate, and just doesn’t happen. This can range from a vinaigrette, chutney, compote, reduction, or authentic chef made sauce. They are moisture, flavor, color and additional mouth feel to a dish, and compliment (or contrast) the other components of the dish. Classically, we have base sauces; they call ‘mother’ sauces. Normally, they apply to entree cooking, and are the base from which our ‘small’ sauces, or finished sauces come. Chefs today do not use these sauces on a regular basis per se (with the exception of hollandaise – how else would you get your eggs benedict?). But the functionality and flavor base of the sauces still exists and still has a HUGE and irreplaceable presence in the kitchen. For example, demi-glace, or our brown meat sauces are directly descended from the sauce espagnole. The primary difference is that chefs don’t use thickening agents.. we rely on reduction and natural thickening, which yields less, takes more time, is more expensive, but produces an infinitely better flavor and purer product. Bechamel is one that also still has a presence. A bechamel is a sauce made from roux (fat/flour) thickened and seasoned milk. In the end, it has the taste and consistency of a thick cream sauce, that won’t break when re-heated. As a base sauce, it’s used in applications like adding stability to lasagnas, moussaka, or as a heavy binder in stuffings, and so on. Take a well made bechamel, add paprika, dijon mustard, gruyure cheese and maybe a little cheddar, and you will have the base of one of the most delicious mac ‘n cheese sauces. Make the sauce. In a small sauce pot, melt the butter and add the onion. Cook until translucent, add the cloves and flour, and cook until paste forms. Little at a time, whisk in the milk. Do not add the milk too fast, it will become lumpy and will never smooth out. Bring to a low simmer, and keep heat low (the sauce will have a tendency to stick to the bottom if heat is too high). Add the nutmeg, paprika, mustard, and grated cheeses. Mix everything well, season with salt (it takes quite a bit) and cook over low temp for about 20 min. Everything should be melted and sauce should be thick. Strain through a medium mesh strainer to remove any lumps, cloves and onion. In a large stock pot, boil the elbows in salted water until al dente. Strain and drain well. Heat oven to 400 degrees. In a baking pan, using your hand, rub oil on the bottom and all sides. In a mixing bowl, mix the sauce with the pasta. Add the cubed cheddar and mix well. Pour into the pan. 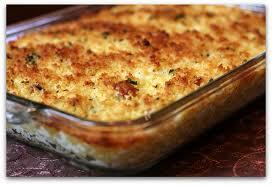 Liberally sprinkle the top with panko bread crumbs to form a nice crust. Bake until browned on top and bubbling. I also love to put mushrooms in the mac ‘n cheese, truffle oil, or a dusting of parm cheese on top. This is not ‘healthy’ food by any means, but it highlights a very current and practical (and delicious) application for one of the classic mother sauces.